Dennis Trillo, Xian Lim, Anne Curtis and their respective partners Jennylyn Mercado, Kim Chiu, and Erwan Heussaff are among the most-traveled celebrity couples. Traveling is one of the ways celebrity couples choose to spend time together. These celebrity couples make it a point to unwind and rejuvenate in a place far from the city center. How do they choose their destinations? PEP.ph (Philippine Entertainment Portal) asks Anne Curtis, Dennis Trillo, and Xian Lim how they plan their travels with their respective partners. Anne and Erwan have gone on adventures together in many places in Asia, Europe, and South America. Most recently, they took a month-long trip around Africa for their long overdue honeymoon; they've been married for over a year and three months. PEP.ph (Philippine Entertainment Portal) asked Anne last December at a mini Christmas event: What was her favorite part of her trip to Africa? She said, "You can't choose, pero definitely hiking to see the gorillas. It was definitely an experience for me." They are probably one of the most-travelled couples in showbiz, and between them, most of the planning of their travels rests on Erwan. Anne said, "It's actually a combination, but then si Erwan talaga who fixes everything. Nagsasabi lang ako, 'I wanna do this, this, this!'" She shared they stick to a budget, "I think it is very natural naman, when you have been together for so long. "You talk about kung ano yung budget niyo and you just decide on what you want to do with your budget." When Dennis and Jennylyn get the itch to get away, they think of places they want to go to. And, oftentimes, his and her favored destination would match. Dennis told PEP.ph in December, "Hati, e. Minsan siya, minsan ako. "Minsan pinag-uuusapan namin, minsan parehas kami naiisip—actually, madalas." "Madalas yung mga gusto niya, gusto ko din, so wala kaming problema." And in case of conflict, Dennis would defer to Jennylyn's choice. He said, "Siya, siyempre. Magpagbigay naman ako sa mga ganun." The GMA-7 actor admitted both of them tend to "over-indulge" when they travel. "Minsan lang namin ginagawa," Dennis revealed, "Parang reward namin sa isa’t-isa. "Pagka ginawa namin yun, usually pagkatapos ng isang malaking project." Their favorite destination so far? "Naka ilang beses na kami sa Amsterdam. Nagustuhan namin siya talaga. "Isa rin sa mga gusto namin na napuntahan namin sa Finland." 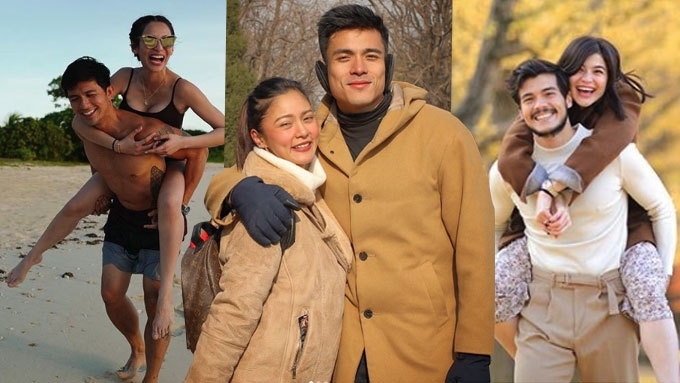 Travelling is one of the ways Xian and Kim wind down. He said, "Sa amin kasi, di ba, sa lifestyle natin, it can get really hectic. And it can get really toxic when it comes to work. "We made it a point to always take some time off." In this PEP Live session with Xian early this month, he also acknowledged Kim's knack for researching their destination. He said, "Tayong lahat naman meron mga dream destinations, so napag-uusapan. "'Tapos siyempre ngayon may Internet na, so [nakikita na] maganda dito, maganda dito. "And si Kim, she's very techie, so she knows how to really know the place. "It really takes a lot of time to pick the destination." And when it comes planning their travel expenses, Xian said, "It's something that you really have to save up. I don't want to use naman the word kuripot... pero I really check, kumbaga, kung where our money is going. "So, you really just have to plan it. Good planning is saving a lot of money." But Xian also underlined, "At the end of the day, you just have to enjoy the travel. "It's not really where you go, but who you are with." Where else do Xian and Kim want to go to? He quipped, "Sa moon! Sa ibang planeta na ang usapan!" On a serious note, he said, "I really don't know. "Sometimes kasi, even when people ask us our Valentine's day plan, ano kami, sobrang spontaneous. "Yes, I said planning, pero yung planning na so far ahead, medyo hindi ako masyado for that. "Kasi sometimes maraming nangyayari, you end up feeling bad na hindi natutuloy. "So maybe, kapag malapit na [you begin to plan."